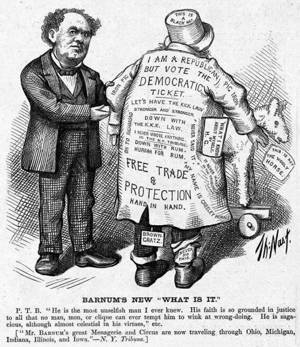 In Nast’s “Barnum’s New ‘What Is It,’” showman P. T. Barnum, a close friend of Greeley, is quoted in the caption praising the candidate’s character. The title’s “What Is It” refers to a sham perpetrated by Barnum at his American Museum in 1859. Feeding on the newly reported evolutionary theory of Charles Darwin and on anti-black prejudice, Barnum (despite being an abolitionist) had billed a short, black man as the “missing link” between apes and humans. Here, Greeley fills that role by incorporating into his candidacy such contradictory notions as free trade and protectionism, pro- and anti-temperance, and pro- and anti-Ku Klux Klan. The Woolly Horse was another Barnum humbug, in which he took a horse with curly hair, reversed it in its stall, and advertised it as a horse “with his head where his tail should be.” Its placement in this cartoon underlines Greeley’s alleged nature of pretending to be something that he was not. The note attached to the horse mimics Nast’s charge that the hypocritical Tribune was an partisan organ that alleged it was not an organ.